New Delhi: The endangered one-horned Indian rhinoceros found in Assam’s Kaziranga park now has an optic fibre link to thank for better protection from poachers who hunt the animal for its horn, widely used in some Chinese and South Asian medicinal preparations. Public sector firm Oil India Ltd (OIL) wanted to install an optic fibre link between Upper Assam and Lower Assam. This will have to pass through the Kaziranga park from Bokakhat to Burapahar. 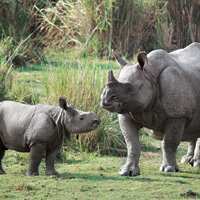 Larger interest: A file photo of a newborn one-horned rhino with its mother inside the Kaziranga National Park, Assam. The park is spread across more than 1,000 sq. km and is home to around 2,000 rhinoceroses. The company approached the Assam Forest Department for permission. The department said it would do so in return for 8,000 litres of petrol and diesel a year which would help it better patrol parks such as Kaziranga—inadequate budgets and the shortage of fuel for all-terrain vehicles is one reason why such parks are not extensively patrolled. “The sanctuary gave us a proposal for providing them with fuel and we have agreed to it. We will do our bit to help them in monitoring the area," said a senior OIL executive, who did not wish to be identified. The deal was vetted by the Central Empowered Committee, which was set up by the Supreme Court to advise it on forestry and wildlife-related issues, and then approved by the apex court itself. After a Supreme Court order in 2000, projects which are not part of the management plan of a national park or sanctuary have to get a go-ahead clearance from the committee. “This is, unfortunately, the only way at present that money can go to parks for conservation work. It is sad that even high-profile parks such as Kaziranga are starved of funds for even guards’ uniforms and park maintenance, leave alone fuel for patrolling," said Ritwick Dutta, an environmental lawyer with Legal Initiative for Forests and Environment, a public interest law group. OIL has also paid Rs1 crore for the Compensatory Afforestation Fund, as of now managed by an ad hoc body created by the empowered committee. Although the fund has collected more than Rs5,000 crore, this money has not been utilized for afforestation activities yet. Users of forest land have to pay the cost of using this for non-forestry purposes; this money is deposited in the fund. Conservationists say payments such as the recent one make more sense for park managements. “This is not just a monetary benefit but symbolic as well. It is no secret that a bulk of the national parks don’t even have vehicles or a budget for fuel for patrolling," added Dutta. “Parks do get some money from the Centre, but not as much as they need. Last year we received Rs46.15 lakh and our average annual budget for fuel is about Rs1-2 lakh. We definitely do not have enough funds and this (deal) will save us a lot (of money)," said Bankin Sharma, divisional forest officer, Assam. The Kaziranga National Park is spread across more than 1,000 sq. km and is home to around 2,000 rhinoceroses.